Scotland. I had always associated Liz Curtis Higgs with her Historical Fiction Series set in the Highlands and Lowlands of Scotland. Every time I see this author’s name, my mind imagines purple heather hills, castles and a fictional storyline that often parallels a Biblical story. Some of the best Biblical Fiction books I’ve ever read, by the way… However, until “It’s Good To Be Queen,” I had not read any of her Bible Study books, but now that I’ve finished reading the last page of Sheba’s story, I know I’ll be looking into more. The easy reading, good natured, yet, dignified writing style of Higgs comes through in each chapter as she examines the Scripture. As she mentions at the beginning of the book, the Queen of Sheba only has a handful of verses written about her and her visit to King Solomon in 1 Kings. Therefore, Liz breaks them down into ten parts (also ten chapters) and digs into each line of every verse. No skimming here! Liz goes over it all. Her study and knowledge of the topic is thorough and complete. At the opening, we see a lovely map of where Sheba’s homeland was in comparison to Israel. Then we hear a few words from Sheba herself (a fictional journal, so to speak) on one page before each chapter. When reading this little piece, I could feel the care Liz took to make Sheba’s thoughts and words as close to what the Bible says the queen was like and keep it in context to the story. 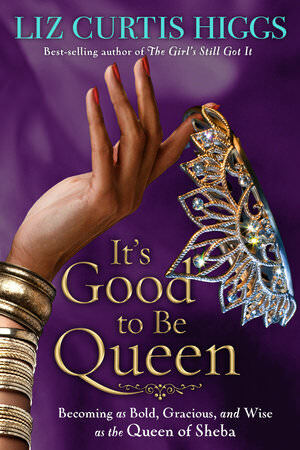 “It’s Good To Be Queen” is a verse-by-verse study of Sheba’s story from 1 Kings. Most of the time, each chapter focuses on one verse and goes through the story chronologically. I loved how Liz debunked some of the myths about Queen Sheba and always pointed to the Scripture as the ultimate source of truth. If the Bible doesn’t say that Sheba had a child with Solomon or anything related to that kind of thing, then it didn’t happen. Our Queen of the South was seeking wisdom, not an intimate relationship. I’ll let you get the book to read Liz’s other reasons for believing this, which, really make sense to me! When choosing Bible Study materials’, think it’s important to know the author has taken the time to thoroughly understand the topic they are writing about and that they have sought to teach what the Word of God says, not just their opinion. After reading Higg’s, I have great trust in what Liz has written and believe that this book would be a great choice for personal or group study. I read the paperback edition of this book from WaterBrook Press, 209 pages in length. Anyone studying the women of the Bible, looking for a good small group or book club study, personal reflection and encouragement.